This diary is for 2016. If you would like to see the diary for 2015, here is the link. Last year, I gave details of the first appearance of various plants, with illustrations as appropriate. This year, I shall not do so so much, unless there is something new to record. 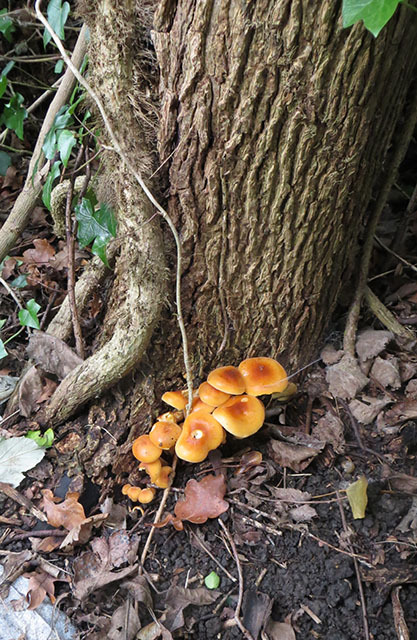 We have not ventured much into the woods in the Autumn and, even when we did, there were hardly any fungi to be seen. 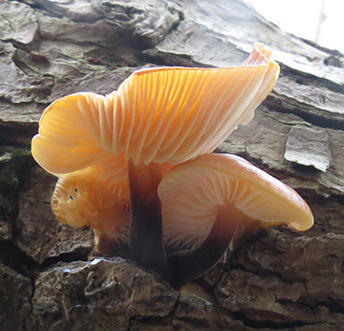 Today, we did spot a few, but most were growing on dead wood. 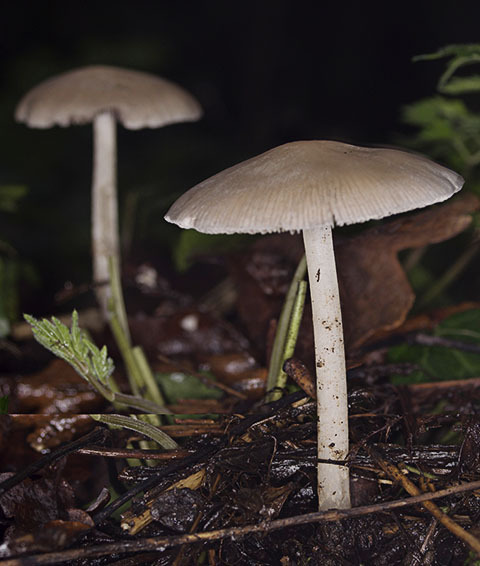 The only ones growing from the ground were the Common Bonnet Mycena galericulata — and that is said to grow from buried twigs below the litter layer. We also saw patches of the Candlesnuff Fungus Xylaria hypoxylon growing on old stumps. 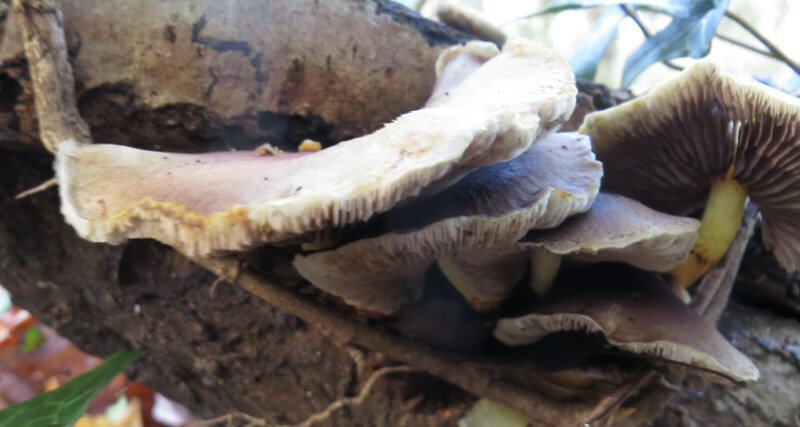 We found three groups of fungi that we had not seen before. Two out of these three we could not identify! 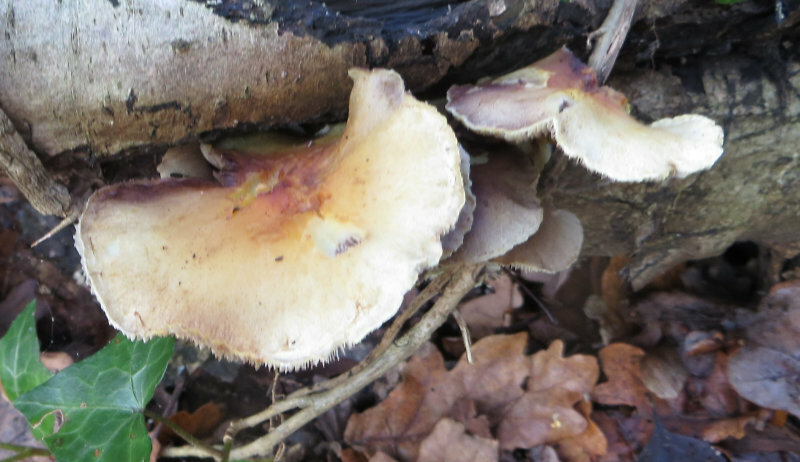 But this first one is, we think, the Common Stump Brittlestem Psathyrella piluliformis. 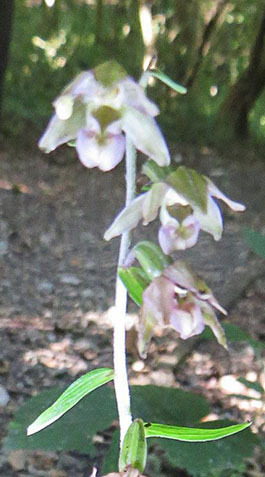 Helleborines are a group of Orchids, but they are not the showy kind at all. 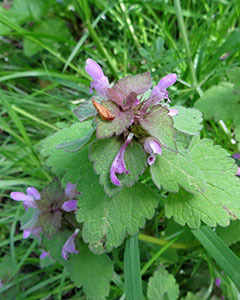 Most are various shades of white, green or purple. 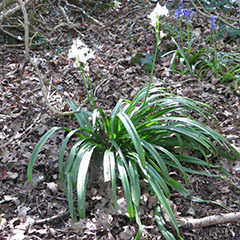 The Commonest species, the Broad-Leaved Helleborine does occur in Coombe Wood, but like most other orchids, its appearance is sporadic. I have not seen it for many years, but following a tip-off from Gwyn Jordan, I found one solitary plant (although Gwyn says there were more). 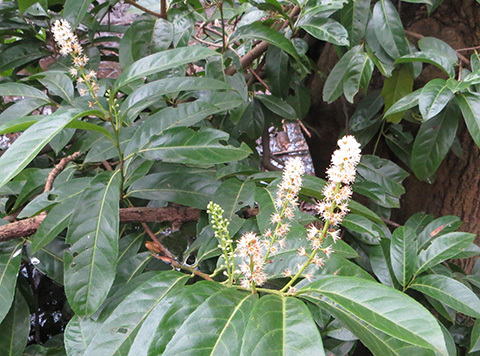 Taking photos of an elongated plant under the canopy in high summer is not easy. The photo here is the best I could come up with. 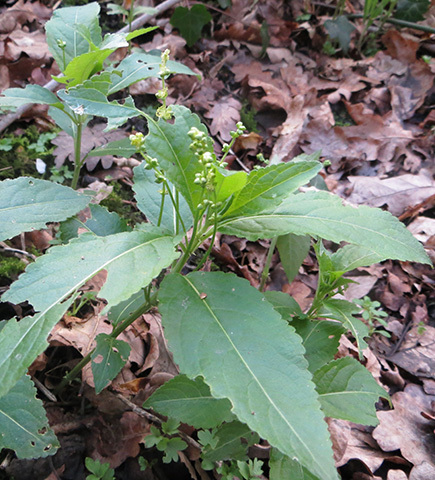 The entire plant was about 15cm tall with each flower less than 1cm across. Compared with last month, the wood was darker as the trees are now in full leaf. 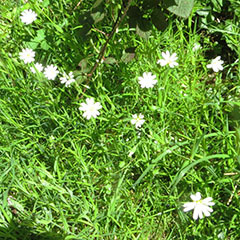 This means that the flowers at ground level get less light and that fewer are in flower. 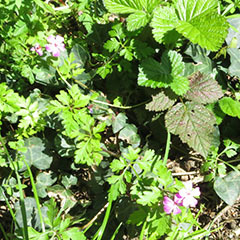 The one on the left is the Broad-leaved Willow-herb. 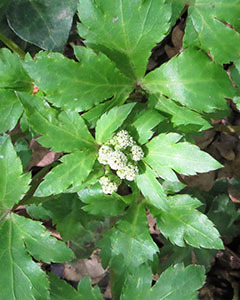 In the centre is Sanicle, an ancient Woodland indicator species. 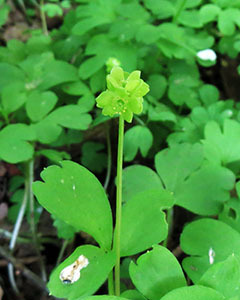 The third plant is not yet in flower, but I think that it may be Yellow Pimpernel. Along the path running parallel to the stream, a dead tree had fallen. The path is blocked at chest height. You can duck under or you can step across just to the right. As it came down, it fell against a Hawthorn, just to the right of the path, partially stripping the branches of this. 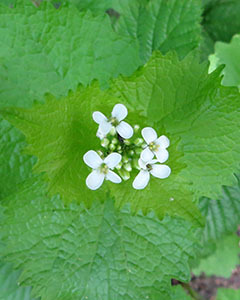 Garlic Mustard, Sanicle and Red Dead-Nettle. 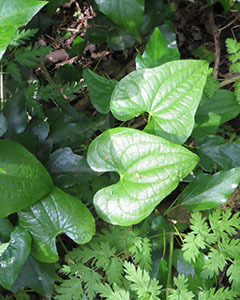 The first leaves of Black Bryony were beginning to appear and climb up the surrounding vegetation. 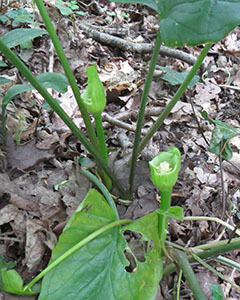 We also saw a Cuckoo-Pint (Lords and Ladies) with two spathes which appeared to have been nibbled. Our best guess is that is evidence of Muntjac deer in the wood. 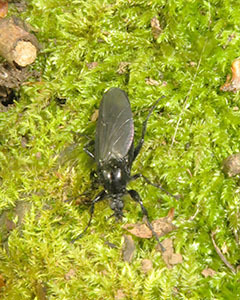 The final picture is of a St Mark’s Fly. This is the first time I have seen such a fly in a wood. They are normally seen out in the open, flying around Cow Parsley. This one was on the moss at the base of a tree. 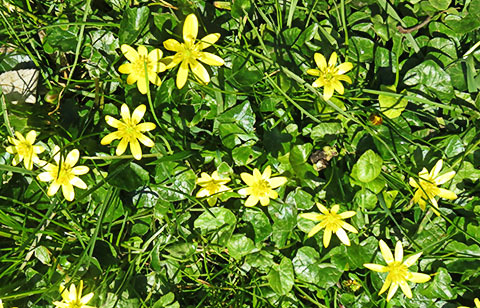 Lesser Celandine, Chickweed and even some white Bluebells. 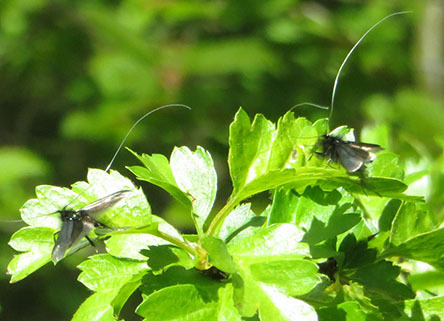 Along the bridleway, we spotted several of these Longhorn Moths hovering around the Hawthorn foliage. These moths are barely one centimetre long, but have incredibly long antennae, four or five times their body length! We also spotted a Brimstone Butterfly and heard a Great Spotted Woodpecker. Finally, a few more Bluebells! 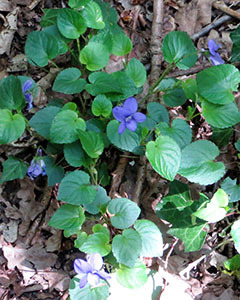 We took a walk through the churchyard and into the northern part of the wood. 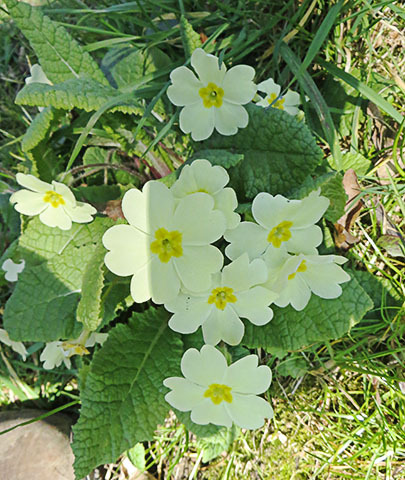 In the graveryard, and along the woodland border, there were many Primroses and Celandines, plus a few Snowdrops. The weather was cool, but sunny which made photographing flowers more difficult. The past fortnight has been a mix of very mild and very cold, and wet and dry weather. Today was fairly mild after overnight rain, but with wind and rain forecast. 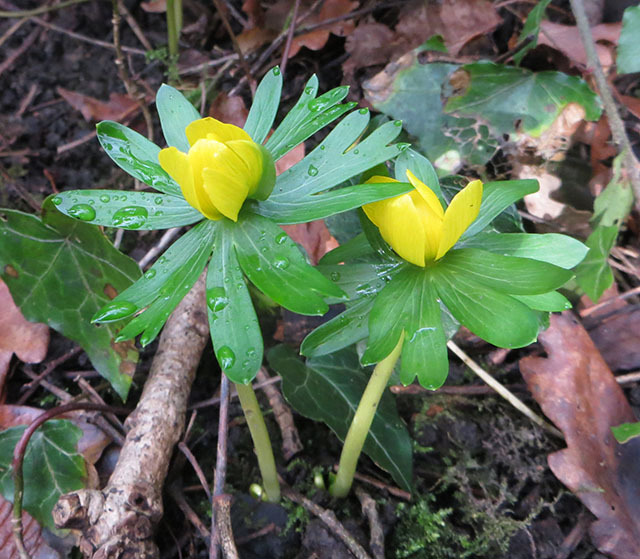 Gwyn Jordan had told me that the Winter Aconites were in flower. I had not been able to find these for the past few years so, armed with Gwyn's detailed instructions, we tracked them down. They were in a patch just inside the wood, but behind the hedge separating the wood from the graveyard, about half way along. 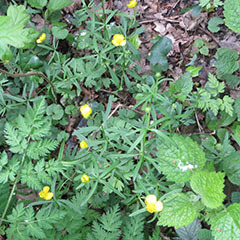 The plants are just a few centimetres high and the bright yellow flowers are just over one cm across. There was also a tuft of what I think is Sulphur Tuft fungus growing from the base of one of the Elm trees in the hedge. 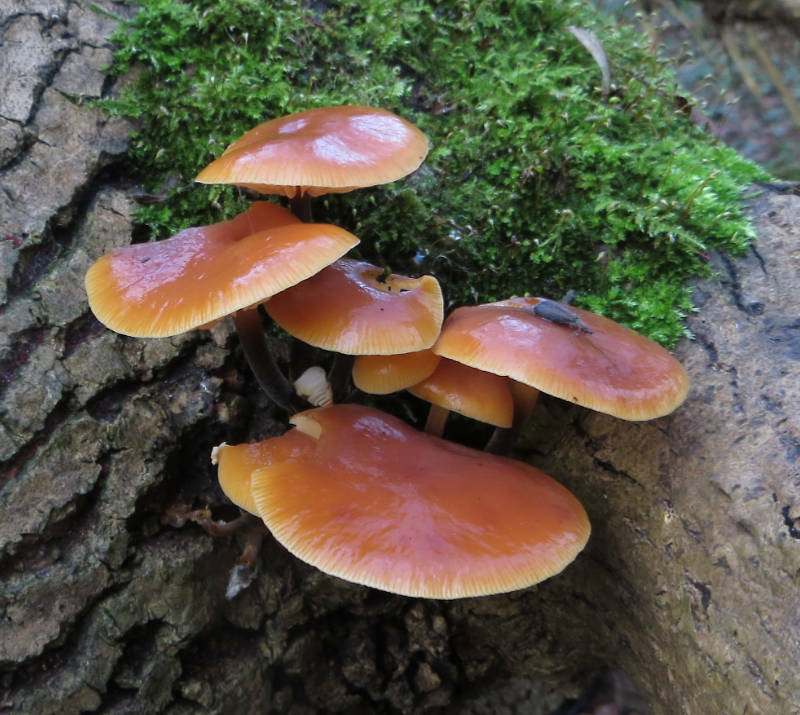 Unlike most fungi, Sulphur Tuft can be found at most times of the year, although with the mild autumn and winter that we have been having one does not really know what to expect. The caps of these were about five cm across and the clump was about fifteen cm across. The pale line at the left is a spider's web! The last month started mild, but the last week or so has been very cold, with frost at night. There had also been a fair amount of rain, though none of it had been very heavy. ven so, the woodland floor was muddy, and the path along the stream was affected by horses. We therefore confined our walk to the bridle path from Rhoda Road to Coombewood Drive. 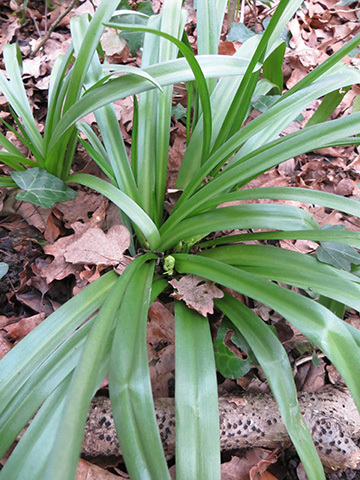 There were many bluebells rosettes in evidence, but we saw the beginnings of flower buds on just one of these. 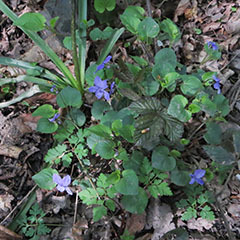 The only other ground-level flower that was beginning to show was the Enchanter's Nightshade (below), on which we saw many flower spikes appearing. 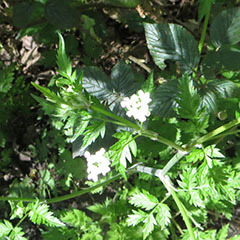 In addition to these there were many woodland plants in evidence on the ground, notably Cow Parsley and Cuckoo-Pint (Lords-and-Ladies). Some of the shrubs were also beginning to show leaves, especially Sloe (Blackthorn), but also some Hawthorn. 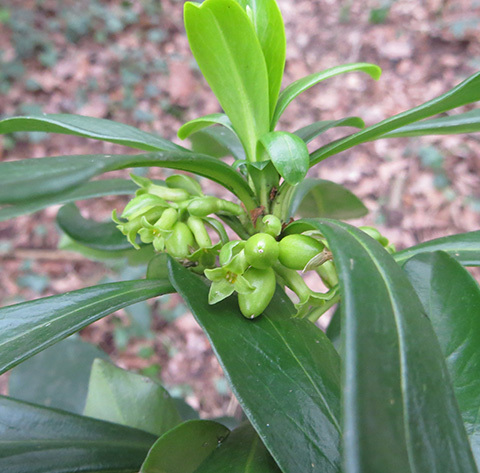 One unusual shrub in Coombe Wood is the Spurge Laurel. 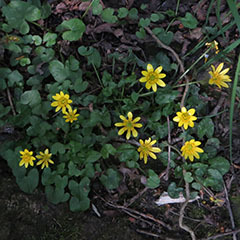 This flowers very early in the year, typically late January. By now, there were still some flowers evident, but in most, they had finished and the fruit below the flower was beginning to swell. 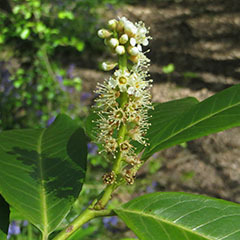 Another shrub in flower was the introduced Cherry Laurel. 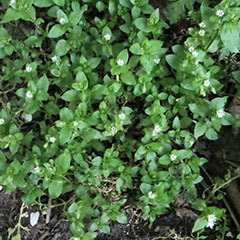 This has spikes of white flowers in the early spring, followed by spikes of poisonous cherry-like berries in the Summer and Autumn. 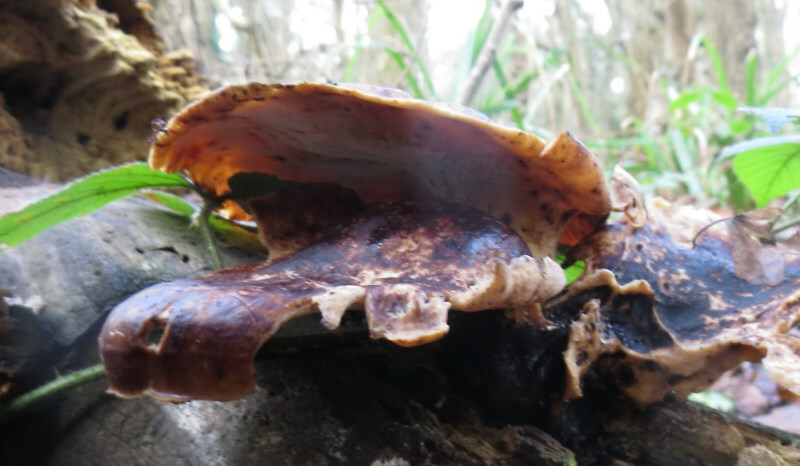 We aslso saw a couple of different Fungi. 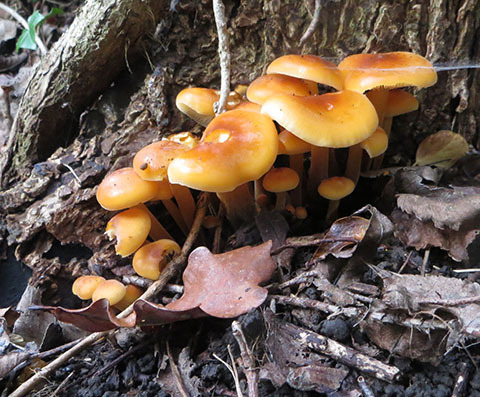 There was a pair of yellow-orange toadstools on a fallen log (which could have been Sulphur-tuft). 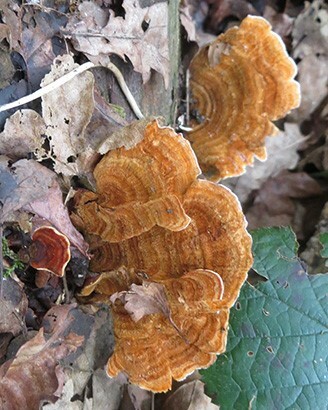 Several fallen branches by the path were covered in an orange bracket fungus, probably one of the Stereum brackets. 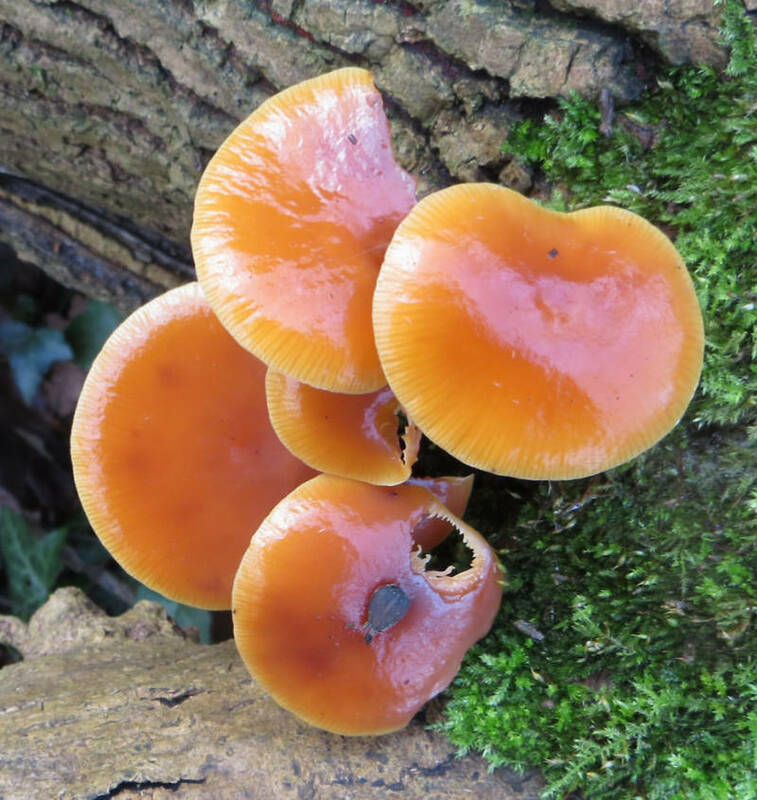 If I can identify these fungi, I will update the diary with their names. The year got off to a very wet start, with rain on most days so far. Today, it has been dryer, so I was able to venture into the wood. I entered through the graveyard walking east towards the stream. There have been very few fungi over the last few months, but today I did discover these two toadstools which I think are the Common Bonnet fungus, Mycena galericulata. 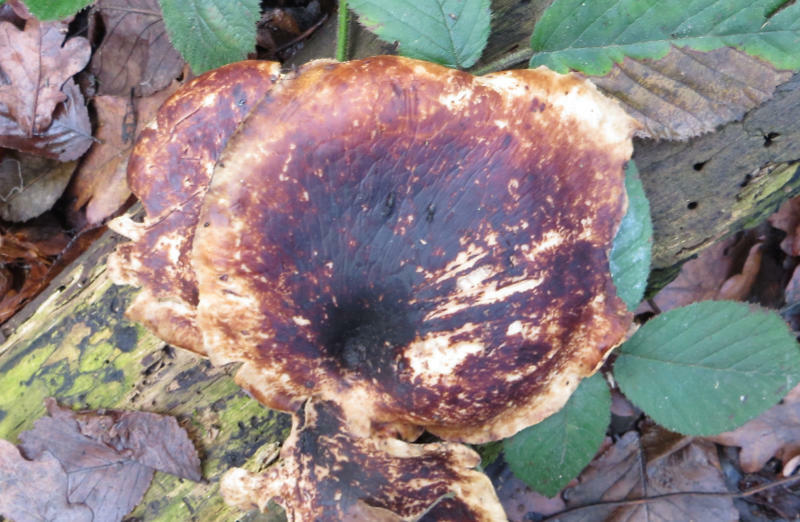 The larger one was about 8–10 cm high and about 4–5 cm across the cap. 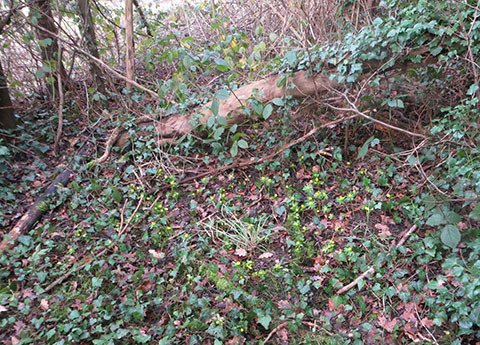 With the recent mild weather, as in my previous visit in December, many of the woodland floor plants were showing green. 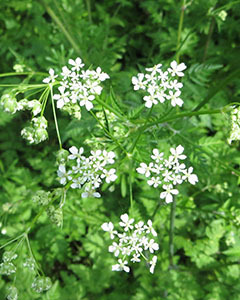 Cow Parsley in particular was plentiful. There is a shoot of this visible in the photo above.